Windows Threshold (Windows 9) is either going to be a complete win or an absolute train wreck. After the response Windows 8 received Microsoft took some pretty drastic actions in 8.1 and it would seem that they are going to take even more in Windows Threshold. They have decided to finally and completely ditch the Modern UI Start Screen and it will no longer be visible for desktop users among other things. A preview of the windows build will be available later this year according to ZDNet.com. Now from what we know, a desktop user will now boot directly to desktop and no longer see the start screen anywhere. The start screen can be re-enabled for anyone who actually misses the GUI. Also Microsoft plans to differentiate Windows 9from Windows 8 completely and I for one think thats a really good plan. Sadly however it seems that we are getting a newly redesigned and reinvented start menu and after the windows 8 fiasco, I cant help but approach this with a wary eye. 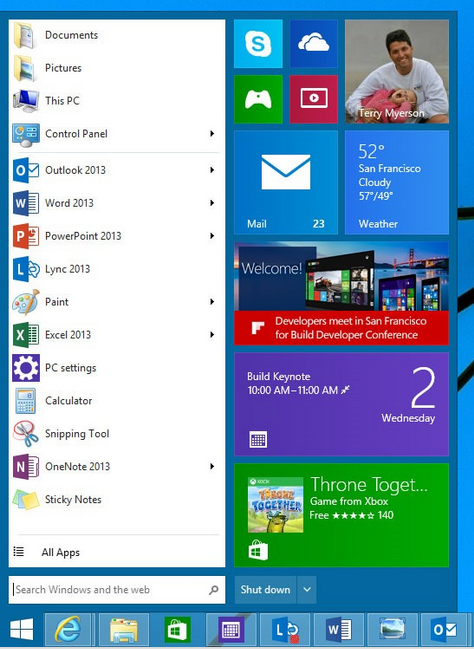 Apparently the new start menu will have some portion of the start screen integrated for a more ‘flexible look’. This includes Live Tiles that will be more or less floating inside the start menu and will represent a cut down metro style switchboard. Thankfully this can be turned off, if the user doesn’t appreciate it. Interestingly Microsoft will allow Metro-Style apps to be compatible with Windows Threshold and ‘float’ inside thier own windows on the desktop. Ofcourse all these changes are only applicable for Windows 9, I assume a completely different schematic will occur for Windows RT and Mobile. Besides, Windows 8.1’s update 2 is going to be arriving sometime in August. This will fix your average bugs and do some minor tweaks and nothing major is expected in this update. Personally, I can’t get over the flat looking aesthetic of windows 8/8.1/9 but maybe that’s just me. Would it be too hard for Microsoft to provide different looks on the same base build? Resorting to after market solutions works of course but usually results in memory hogging, bugs or both together. Needless to say, the enthusiast community is awaiting the release of Windows 9 with pitchforks in hand, and to be honest, I cant say I blame them.